I turn to face a stout, broad-shouldered dude sporting a blue mohawk. ‘You goin’ to fourth hour?’ he growls. Tuesday starts off as any normal day would. Brian and his friends are at school, only missing Hollis who is off sick. Skipping fourth means not much hassle, aided by the fact they seem to be the only ones out and about, but returning for seventh period makes them question whats going on. Stagecraft is usually an easy A but when anarchy breaks out across the school Brian, Chad and the bunch of drama geeks who usually don’t give them the time of day, are in it together to stop whatever epidemic is sweeping the kids outside the theatre doors from getting to them as well. I was enticed into reading this book by the claim that it was The Breakfast Club meets The Walking Dead and in all honesty I can seriously see where that claim comes from. The characters are not usually the type to hang out together and they learn a lot about each other and their lives because of the events that happen, because of the virus that sweeps their town, and I really enjoyed it for the most part. The story is good and I really liked the way that the zombie epidemic grew, it made sense and was explained well.. The story mainly focusses on Brian and his problems before and after the virus hits, the hope of finding his sister and the dilemmas facing the split with his ex and his search for her and what that means to him. I liked the idea of the misfits and the drama geeks fighting together and having hoped and I really liked where the book left off, with a bit of ambiguity and hope for the characters. There is a lot of death in this book and a lot of blood and gore as you would expect from a zombie book… therefore I really do think its title is apt but have to say it wouldn’t be suitable for many under the 14/15 age bracket! I found it quite graphic in places and some of the situations the characters find themselve in explore adult ways of thinking… The characters are 17/18 and ou can really tell that this book is a statement on the limbo you are in at this age, on the cusp of adulthood but not quite there yet. 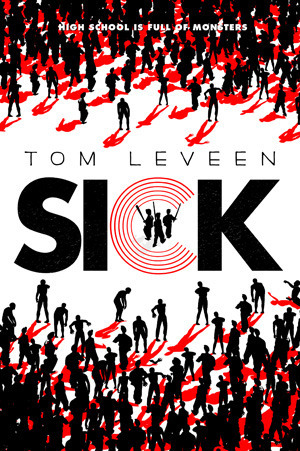 The only problem I had with this book is the narration… I have tried to read Tom Leveen books in the past and found his style of writing and the narration techniques a little off putting; so much so I don’t think I completed any of his book until this one. I didn’t actually realise it was the same author as those books when I requested the review copy and probably wouldn’t have requested it had I known, however after it arrived and I worked it out I thought I’d give him the benefit of the doubt. I wanted to love it but I just think this authors style is very unique and will not be for everyone, myself included. If you like your zombie horror/survival stories then it is worth checking this one out, the authors style may be more your cup of tea than it is mine and I can guarantee that if that is the case you will have a book you love right there! Sick is published on 1st October by Amulet books. My copy was sent to me from the publisher in exchange for an honest review. I’m intrigued but odd writing styles tend to put me off, I might have to give this one a miss. Great review! This is something that I would want to read.